Posted on November 10, 2014 by Daniel Dexter. As students enter the new Electrical and Computer Engineering Building, they are welcomed by two sculptures symbolizing the influence ECE ILLINOIS has had on the world. 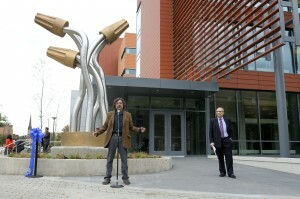 The two sculptures, “Amplifiers” and “Diss-Connections,” were unveiled to the public Oct. 10, 2014, as a part of the Electrical and Computer Engineering Building’s dedication ceremonies that day. Professor George Gross, chairman of the Illinois Art-In-Architecture committee that commissioned the work, introduced the sculptors during two short art dedication ceremonies. The Capital Development Board administrates the Art-in-Architecture Program to promote and preserve the arts by commissioning works of art for public buildings. The ECE Building project cost $95 million, and the State of Illinois paid for half of it. Private and corporate donations paid for the other half. At the east entrance of the building stand two structures that make up the “Amplifiers” piece by Nicole Beck. The sculpture is a representation the work of two ECE ILLINOIS legends, John Bardeen and Nick Holonyak Jr. The piece representing Bardeen is on the north, and Holonyak, the south. In preparation for the construction of the sculpture, Beck spent time studying Holonyak’s discovery of the first visible LED. It became her inspiration for the sculpture’s oscillating pole design. 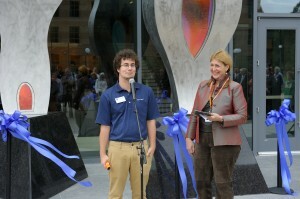 ECE ILLINOIS senior Brady Salz talks about his work on the LEDs in “Amplifiers” during the the piece’s dedication ceremony as sculptor Nicole Beck looks on. Beck expressed gratitude to ECE ILLINOIS senior Brady Salz, who assisted with the LED lighting on the oscillating panels of the sculpture. Salz said that since coming to ECE ILLINOIS, working with lights is something he has always wanted to do. At the ECE Building’s Wright Street entrance, John Adduci’s “Diss-Connections” reminds students of one of the most fundamental elements of engineering: wire. He came up with the design for the ECE building’s west entrance while touring Everitt Lab and seeing wire everywhere he looked. Sculptor John Adduci talks about “Diss-Connections” at the piece’s dedication ceremony Oct. 10, 2014. Professor George Gross looks on. Adduci said the design is supposed to be simple and symbolic of the connections engineers make in their work. In his introduction, Gross praised Adduci for the fluidity of his metal work on the sculpture, and said it’s a welcome piece for a heavily used entrance of the new building.